Chiara Banfi, Confluência 5 (Confluence 5) (detail), 2015, mixed media, dimensions variable. Chiara Banfi’s “Notações” (Notations) opened just weeks after the journal Science heralded Earth’s official entrance into the Anthropocene; aptly, her exhibition is a study on her discovery that human manipulation of geology is invisibly essential to music. An extremely accurate indicator of frequency and rhythm, quartz is here poised as a technically proficient object, while musical scores are altered to more closely resemble patterns of the natural world. Banfi plays with the visual metaphor provided by tourmaline, a thin onyx-like mineral that naturally embeds in quartz. A wall installation, Pauta (Staff), 2016, points out how, when arranged, this implanting phenomenon can mimic a musical score. Meanwhile, the installation Pausa de Bach (Pause by Bach), 2016, presents a dozen music stands holding various scores by the German composer. (Twelve is symbolic of his twelve semitones.) Everything on the pages, however, has been blacked out, save for pauses. The inversion of the text brings out visual noise where there should be silence—much like how quartz inversely functions to measure what’s here been blacked out. 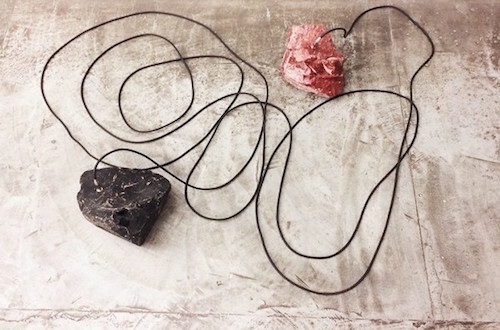 Behind this work, thirteen obsidian stones from various parts of the world are patched together by RCA cords in Lin Melódica (Melodic Lin), 2016. Upstairs, Banfi expands on this piece in her series “Confluência” (Confluence), 2015, and again loops together a sundry of stones. It is the only place in the show where they actually appear on the ground, as they might be encountered, though we might trip over their wiring. The convergence seems a reminder of how as music becomes increasingly free, both in accessibility and variety, it cannot be entirely abstracted from the materials that support it.